Don’t Paint Whale — Paint Whaleness! Recently, Lisa Pedersen (@lisapedersenart on Instagram) reminded us of this brief and very lively excerpt from a talk that Stewart gave at a workshop in Southern California. 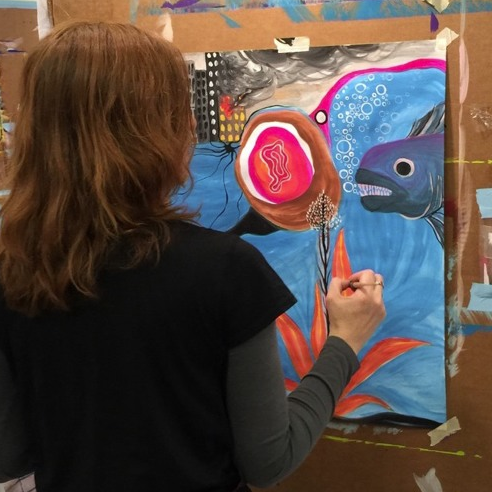 In the following conversation with a workshop participant, Stewart brings to life that moment when we are asked to take a courageous leap by painting something we think we can't. In other words, if you think you can't paint a whale, don't paint "whale" at all -- paint whaleness! To hear more from Stewart, check out our podcast series. To get advance notice of upcoming workshops, sign up for our newsletter. And to see what's coming right up, check out our schedule of upcoming process painting retreats and online painting classes. GET EVERY NEW POST BY EMAIL!